International diplomat Kofi Annan of Ghana is the seventh secretary-general of the United Nations (UN), the multinational organization created to, among other things, maintain world peace. He is the first black African to head that organization and was awarded the Nobel Prize. Noted for his cautious style of diplomacy, Annan is sometimes criticized for his soft-spokenness, which some say may be mistaken for weakness. Kofi Atta Annan was born in Kumasi, in central Ghana, Africa, on April 8, 1938. Since 1960 Ghana has been a republic within the British Commonwealth, a group of nations dependent on Great Britain. Named for an African empire along the Niger River, Ghana was ruled by Great Britain for 113 years as the Gold Coast. Annan is descended from tribal chiefs on both sides of his family. His father was an educated man, and Annan became accustomed to both traditional and modern ways of life. He has described himself as being "atribal in a tribal world." After receiving his early education at a leading boarding school in Ghana, Annan attended the College of Science and Technology in the capital of Kumasi. At the age of twenty, he won a Ford Foundation scholarship for undergraduate studies at Macalester College in St. Paul, Minnesota, where he studied economics. Even then he was showing signs of becoming a diplomat, or someone skilled in international relations. Annan received his bachelor's degree in economics in 1961. Shortly after completing his studies at Macalester College, Annan headed for Geneva, Switzerland, where he attended graduate classes in economics at the Institut Universitaire des Hautes Etudes Internationales. responsibility, operations in the former Yugoslavia were turned over to the North Atlantic Treaty Organization (NATO). The post of secretary-general of the United Nations has been called one of the world's "oddest jobs." According to the United Nations web site, "Equal parts diplomat and activist … the Secretary-General stands before the world community as the very emblem of the United Nations." The secretary-general is the boss of ten thousand international civil servants and the chief administrator of a huge international parliamentary system (a governing body with representation from many nations). In this post, Annan is expected to coordinate, although he does not control, the activities of such groups as the WHO and the United Nations Educational, Scientific, and Cultural Organization (UNESCO). He is also expected to practice "preventive diplomacy," meaning he and his staff must try to prevent, contain, or stop international disputes. Above all, Annan must try to maintain world peace. In an address to the National Press Club, Annan declared, "If war is the failure of diplomacy, then … diplomacy … is our first line of defense. The world today spends billions preparing for war; shouldn't we spend a billion or two preparing for peace?" Almost immediately after Annan's election to secretary-general came the question: Is this man just too nice a person for the job? His reputation for "soft-spokenness," according to U.S. News & World Report, could be mistaken for weakness. 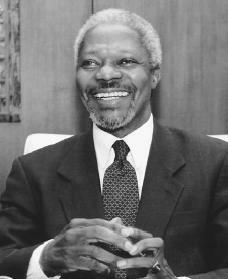 Another factor that made people question Annan's toughness was his involvement in the UN efforts at peacekeeping in Bosnia from 1992 to 1996. Despite the United Nations's presence, Bosnia remained the site of an ethnic war (a war between religious or cultural groups), in which thousands died. Sir Marrack Goulding, head of peacekeeping, once commented that Annan never expressed his doubts about the UN policy in a forceful manner. Annan disagreed, saying that he always pressed the involved countries—the United States, Britain, France, and Russia—to rethink their policy on sending soldiers to the peacekeeping force. Not one to raise his voice in anger, Annan favored diplomacy. In a press conference in Baghdad, Iraq, in 1998, Annan noted, "You can do a lot with diplomacy, but of course you can do a lot more with diplomacy backed up by fairness and force." All eyes turned to Annan and his handling of the touchy situation with Iraq in 1998. Early in that year, threats of war seemed all too real. Saddam Hussein (1937–), president of Iraq, became once again a threatening presence by refusing to let UN observers into certain areas of his country, as had been previously agreed upon, to check for illegal possession of chemical-warfare items and the like. Then-president Bill Clinton (1946–) hinted strongly at the use of force to make Hussein agree to let in the UN officials. In his role as secretary-general, Annan went to Iraq in February of 1998 to meet with the Iraqi leader. After talking with Annan, Hussein agreed to what he had refused before—unlimited UN access to the eight sites that he had previously called completely off-limits. Because of Annan's intervention, war was avoided. Tessitore, John. Kofi Annan: The Peacekeeper. New York: Franklin Watts, 2000. Angelou, Maya Anthony, Susan B.